What is Spring Data Rest? How does Spring Data Rest make building REST API easier? How to integration Spring Data Rest with Spring Data JPA? What are important features of Spring Data Rest? 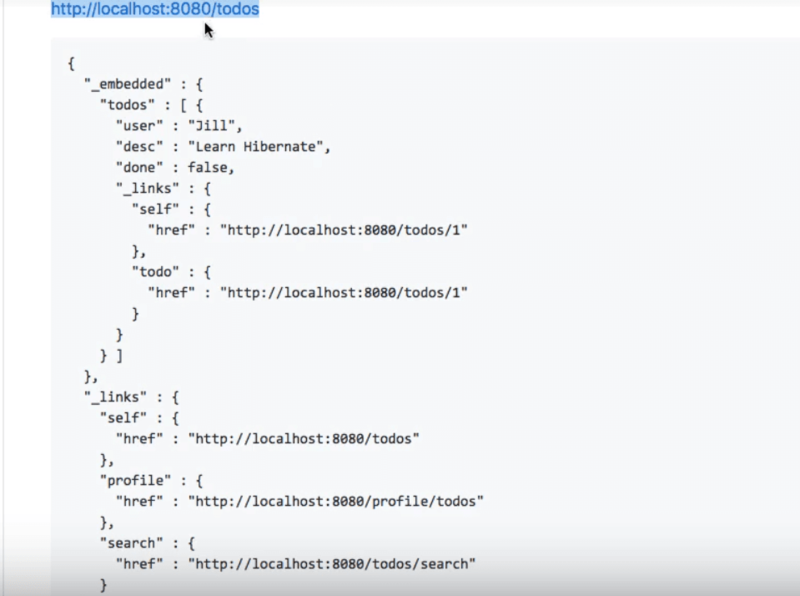 How to execute REST API created using Spring Data Rest? What Does Spring Data Rest Do? Exposes REST services around the Spring Data, without having to write a lot of code. Supports both SQL-based and No SQL-based databases. Spring Data Rest is ideal for simple projects, that quickly want to get started with creating REST API. 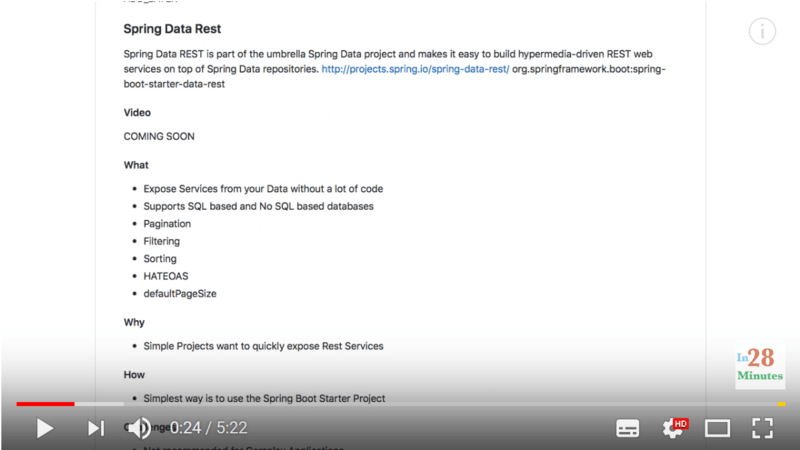 Let’s look at a quick example of using Spring Data Rest to build a REST API. Note that we have included the dependencies such as Web, JPA and Rest Repositories.You can generate the project, and then import it as a maven project into Eclipse IDE. @Entity Todo has an Id, and has a few fields and methods. Once you have an entity, you can create a RepositoryRestResource for it. Once you have the Entity and RepositoryRestResource, you are ready to fire your requests. You can see that the link of the created resource is returned to you. You can do a search on the repository by typing in a query such as: https://localhost:8080/todos?user="Jill"
You can also do a search by directly invoking the repository method: https://localhost:8080/search/findByUser?user="Jill"
When to use Spring Data Rest? Remember to use Spring Data Rest only for simple projects. It is great to use when you are building a prototype for your application. However, when it comes to production applications, you need to think twice before using Spring Data Rest. In this article, we had a look at Spring Data Rest, which is a framework used to build REST services around Spring Data repositories. It is ideal to use with simple applications or prototypes. In this article, we understand the basics of Spring Boot framework. We look at the important features of Spring Boot and how it is different from the Spring framework.